You may have seen a Himalayan salt lamp at a friend's or neighbor's house, and it caught your attention that they had a huge piece of illuminated salt. But these are not just simple and attractive decorative pieces that illuminate any room, which in recent years have been gaining popularity around the world, thanks mainly for many benefits that its defenders attribute to it. Therefore, to clear up any doubts about salt lamps, today we will tell you what Himalayan salt lamps are, as well as 12 important facts you should consider about these lamps before you buy one for your home or office. What are the Himalayan Salt Lamps? Himalayan salt lamps are solid blocks of pink salt crystals, extracted from underground mines on the western edge of the Himalayas in Pakistan, the only source for this type of Himalayan pink salt. The color of Himalayan salt lamps varies according to the concentration of minerals, from light pink to reddish-orange tones. The pink crystals, after being extracted, are carved and hollowed out, either to install a low-voltage bulb and convert it into a salt lamp, or to convert it into a salt candle holder, with the heat emitted being that which transmits, either from the bulb or candle, which generates the beneficial effects attributed to it. Himalayan salt lamps are used for different reasons, from the beautiful lighting that the pinkish color of the lamp transmits its effect on decoration, how it stimulates relaxation or the positive health effects attributed to it. What's the Most Important Thing About a Himalayan Salt Lamp? In our home environment, floating in the air, there is an enormous number of particles, from pet dander, dust or allergens that are trapped by water molecules. Faced with this, the salt from the Himalayan salt lamps it has hygroscopic benefits, which means it acts like a magnet for water vapor, attracting it along with all the allergens, and then the latter is trapped in the lamp once the heat it emits evaporates the water. The larger the Himalayan salt lamp, the larger it's the surface area, the more allergens it will be able to trap, and the larger the area of the house benefited. It is important to remember that, thanks to this effect of attracting and accumulating dust from the air around it, every few weeks or every month you must disconnect the lamp to clean it properly. Another of the benefits claimed to have the Himalayan salt lamps is that of releasing negative ions that are oxygen atoms with an additional electron. These negative ions are normally produced in nature through water, air or sunlight, and this is where, in part, that feeling of rejuvenation comes from when you go for a walk in the mountains or near a waterfall. The defenders of Himalayan salt lamps argue that the lamps can, to some degree, mimic that effect. 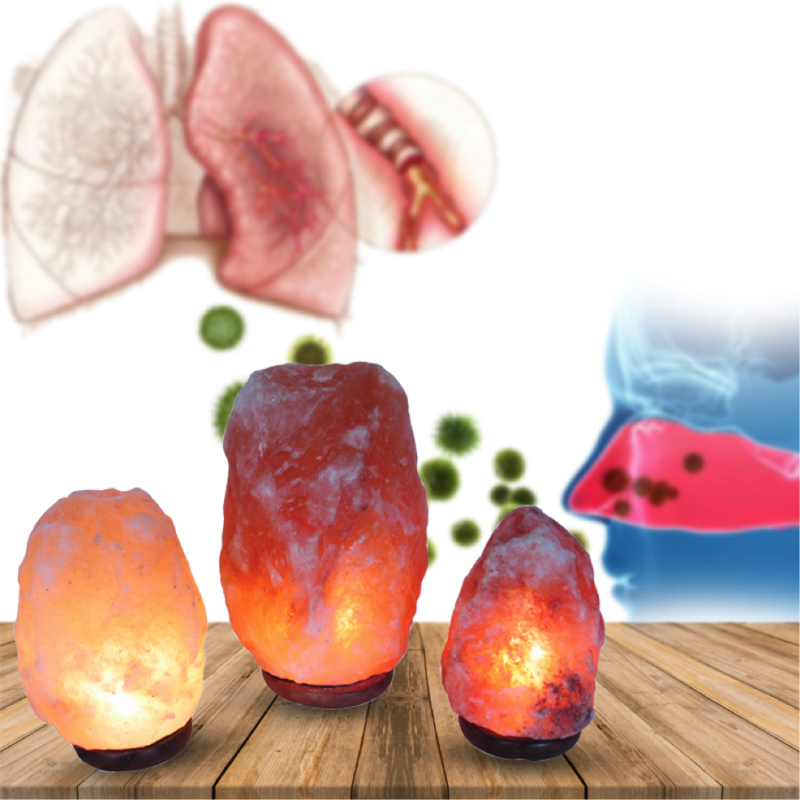 Thanks to the ability of Himalayan salt lamps to attract dust or other particles in the air, they help people with allergies or asthma by acting as filters that purify the air, keeping pollutants that generate allergies away from our lungs. Not only are many allergic people claiming to see a decrease in their symptoms when they are near a Himalayan salt lamp, but even Himalayan salt inhalers have been created. One of the drawbacks of positive ions in the air is that the cilia, the microscopic hairs that line the trachea, become slow and do not work as well as they should to keep air pollutants out of the lungs. A Himalayan salt lamp, when it starts its hygroscopic cycle and begins to absorb the water around it, along with the dust it contains, also absorbs the positive ions. Then, when the hot Himalayan salt lamp releases water in the form of steam, it not only cleans the air but also expels the negative ions that have the opposite effect on our airways, increasing the ability of the cilia to keep our lungs clean. In the technology-filled world of the XXI century, constantly surrounded by cell phones, televisions, computers, and other electronic devices, it is normal for us to be surrounded by electromagnetic radiation (EM), as well as for there to be concerns about how overexposure to EM radiation can have detrimental effects on health. Users of Himalayan salt lamps claim that by placing them near an electronic device, the negative ions in the lamps reduce or neutralize exposure to EM radiation, as well as providing the additional benefit of reducing static electricity in the air. Positive ions present in the environment can have effects on bedtime, draining your energy levels and preventing you from replenishing them. This is because positive ions reduce the supply of blood and oxygen to the brain, which can lead to irregular sleep patterns. Faced with this, the defenders of Himalayan salt lamps claim that the negative ions that these lamps generate can counteract the effect of positive ions, reversing the problems they generate in sleep. In this way, by simply connecting your Himalayan salt lamp during the day, or at night at bedtime, your room will obtain an atmosphere of peace that will help you sleep better. Thanks to the release of negative ions on the part of the salt lamps of the Himalayas, when helping to improve the circulation of blood and oxygenation of the brain and other organs, it is possible to improve our state of mind and even have a positive impact in our concentration. Additionally, they boost the production of serotonin, the neurotransmitter responsible for happiness. Light therapy is a new, but quite effective, treatment for the seasonal affective disorder, or SAD. Those living in northern climates may experience SAD during the winter, so the brightness generated by a Himalayan salt lamp, that can mimic the warm glow of the sun, can potentially help alleviate the symptoms of SAD. The ability of Himalayan salt lamps to purify the air around them can have beneficial effects on some skin diseases, such as eczema, which are negatively affected by the amount of dust present in the air. Of course, air purification from Himalayan salt lamps alone cannot solve skin problems, but it can help reduce symptoms, especially when used in conjunction with other treatments. The pink color generated by the Himalayan salt lamps creates a therapeutic and relaxing shine that has a positive effect in any room. It can be used as an integral part of an altar, or as a simple decorative element to enhance any space in your home or office that has a mystical or meditative purpose. There is an additional advantage for those who want to protect the environment, and that is that Himalayan salt lamps use low wattage bulbs, so their electricity consumption, as well as their negative impact on the environment, is low. And if that's not enough, and you want to have zero electricity consumption, you can opt for a salt candle holder. Although a modern solution is to use a salt lamp that utilizes an electric bulb to operate, an alternative solution is to use a salt candle holder. First, you should consider that a salt candle holder does not require electric current to provide the same benefits as a Himalayan salt lamp that uses a light bulb. Second, with a salt candle holder, you get the same benefits already mentioned as using a salt lamp. And third, by using a candle, you get additional advantages, for example, the unique lighting that can be given by the flame of a candle in combination with the pinkish colors of a salt candle holder, which you can mix with the use of aromatic candles, giving a space a unique lighting and scents. These advantages make a salt candle holder an ideal choice for places such as massage sauces, doctor's offices or anywhere you want to create a relaxed atmosphere.